Soup is undoubtedly one of my favourite things to have for lunch. I love how warming it is, the comfort you get from a big steaming bowl and the vast variations of soup flavours. Shop bought soups are so often full of rubbish ingredients like added sugar, loads of salt, preservatives, cream and unhealthy oils but you can so easily make a soup at home super simply, with very inexpensive ingredients and it tastes far nicer fresh than from a carton or can! 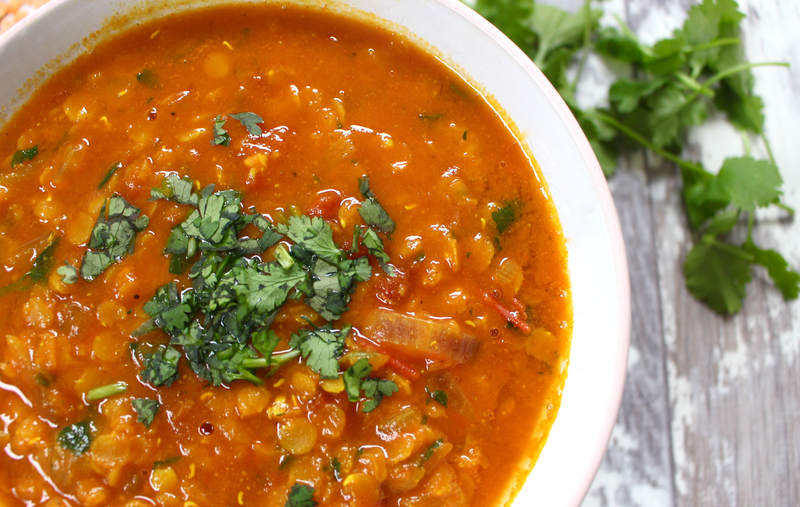 I love all sorts of flavours of soup but my favourite is this hearty, nutritious, delicious tomato, lentil and coriander soup as it's just so comforting, so bursting with flavour, fills you up and the best part is it doesn't require a blender! I know plenty of people are put off making their own soup because they think it requires lots of time, patience and leaves you with masses of washing up which can be the case, but not with this soup! You practically throw everything into the saucepan and let it cook away! On top of that, it can be kept in the fridge for 2 days and even frozen so you can make a big batch and come back to it whenever you're craving a lunch to warm your body and soul. 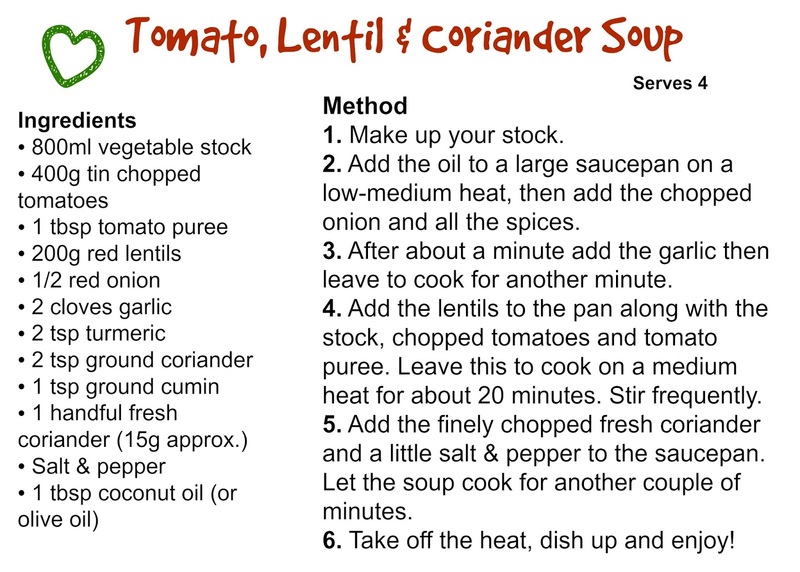 Lentils are a real winner when added to any diet as they're packed full of goodness that your mind and body will love. They're high in good quality protein, fibre, folate, iron and magnesium which makes them a heart-healthy food due to their ability to help lower cholesterol and decrease your chances of developing heart disease. Plus, the calcium and potassium in lentils has also been shown to decrease blood pressure naturally! Lentils are a wonderful food for your happiness levels too as they're loaded with iron to fight fatigue and keep your energy up. 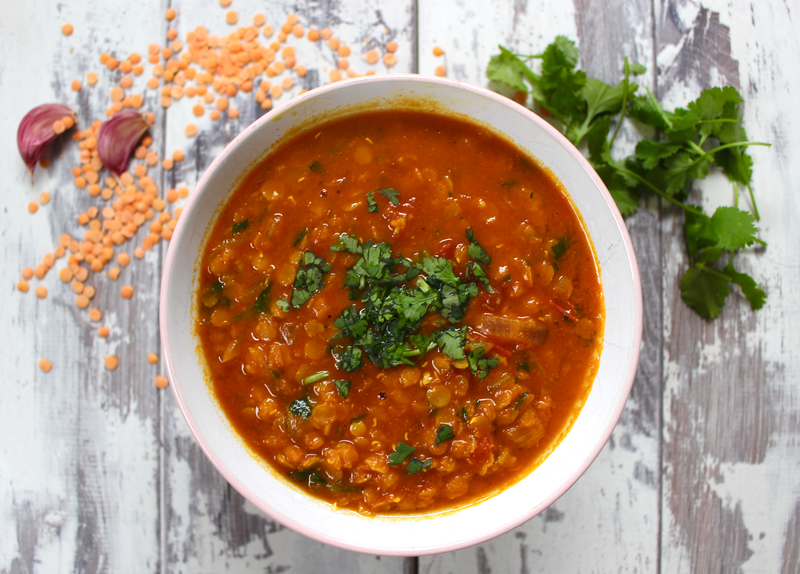 As well as the lentils this soup contains turmeric, ground coriander and ground cumin - delicious spices that all hold brilliant benefits such as anti-oxidants and anti-inflammatories.